"It was hell, really. It was hard to hold a job before the union came." That's how Annie Henry, a certified instrument processor at the Johns Hopkins Hospital in Baltimore, remembers what life was like for workers at the hospital. Another worker, William Watkins, recalls in "A Dream Come True" that there were employees who'd been with the hospital for 20 years but never got a raise, simply because their supervisors didn't like them. That changed in 1968, with the help of Coretta Scott King. Just weeks after her husband was assassinated while supporting striking sanitation workers in Memphis, Mrs. King urged union Local 1199 to continue Dr. King's work by organizing hospital workers around the nation. According to 1199 members still working at Hopkins today and interviewed in this documentary, Mrs. King's visit changed everything, leading them to a successful organizing drive and a better relationship with their employer. Laura Pugh, a cook with 41 years' experience, sums up the difference this way: "It is incredible to be able to sit down with [hospital] big bosses, vice presidents, presidents, no matter who it is … and talk, and get things settled." Does "transportation" include things like sidewalks and crosswalks, bike lanes, and mass transit? Or is "real" surface transportation pretty much limited to cars and highways? That was the question Congress was struggling with as the House and Senate proposed new multi-year transportation bills for the nation. Only the proposals weren't transportation bills — they were highway bills, with a bit of railroad thrown in. And they would have marked a departure from previous laws passed under both Democrats and Republicans, laws that included Safe Routes to Schools and funding to make sure pedestrians, cyclists and others can use the country's roads and bridges too. The gaps in those proposals led to this video, a look at what the new laws would ignore and why alternatives are important. It initially appeared on two blogs in DC, GreaterGreaterWashington and TBDOnFoot, and was quickly picked up by blogs and websites around the country, both national ones like Streetsblog ("Congress to America: Get a Car") and many local sites, from Marin County to Salt Lake City to New Jersey. Not that we can claim credit, but by the end of the week the House bill was a shambles which the House leadership was scrambling to replace, while the Senate bill had accepted a bipartisan amendment to restore funding for such projects. 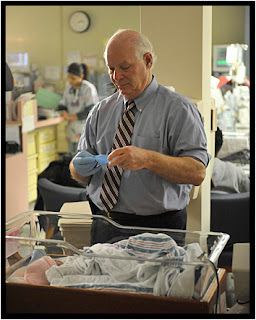 That amendment was thanks in part to Maryland's own Sen. Ben Cardin — whom we happened to be photographing at the end of the week as he spent time "helping out" workers at Prince George's Hospital, below.